I was going to comment on something similar to this after my previous posts highlighting the generally poor user security awareness across the enterprise AND consumer spaces. The article is useful as an indicator of where the problem lies, but gives me chance to makes a couple of additional comments. The obvious problem is that the more we follow the first three of those points, the more likely people are to need some easy way of remembering their passwords – writing them down, or otherwise documenting them can be a good way of doing that. There are better solutions – SSO (‘simplified sign on’), or password lockers (typically with a master password) that can help with this – even the options to remember a password in a browser can help (note that, conceptually, this is no different from writing it down, but is likely to be less obvious or otherwise protected). Attacks against password stores, as mentioned, provide some very interesting points of analysis – the way that breaches of stores at different sites/hosts can be used for comparison of the commonality of password reuse is obviously of particular interest and provides a good case to argue against such practices. This is a good example that anyone can see of why it’s a bad idea. On the other hand, it’s perfectly reasonable to argue that it shouldn’t matter – if user credentials were stored securely then we wouldn’t have the information to even begin this analysis. Attempting to educate users of a system in security is pointless if the admins and owners of that system can’t do the basics. Add to that the sometimes conflicting messages and the lack of sense shown by some security wonks and it’s not a wonder that users are the weak link in the process. Security teams would do well to get the basics right in systems as well as demanding more from people. Humans are the problem, but focusing on technical restrictions on passwords is not the place to start. No matter how simple, or oft-used a password is the simplest attacks are against those that are told to someone, either electronically (such as phishing), or through bribery such as with a bar of chocolate. Of course, even aside from bribery there are other ways of getting a password, no matter what security is put in place. 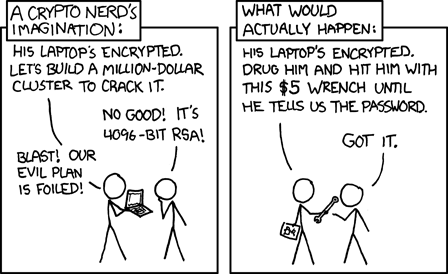 (from the always excellent xkcd comic). This concept is tradionally known as a rubber hose attack and is the best indication of the weakness of the flesh in security. This entry was posted in Uncategorized and tagged breach, hacking, passwords, security, sso, users, www by Paul. Bookmark the permalink.